Looking beautiful wedding hairstyles to go along with your gorgeous dress? We picked out 10 gorgeous ideas for every hair type, so you’ll find exactly what you’re looking for. Check out these beautiful wedding hairstyles and you’ll see what I mean! I knew someone who wore a loose fishtail braid on her wedding day, and it was absolutely stunning. I think a fishtail braid is elegant and simple, and can be a great way to showcase your dress because your hair is somewhat understated. This hairstyle works best with long hair. There are so many ways to wear this wedding hairstyle! The bride in the first picture went with one center braid and two little ones. I also really love the look of the looser fishtail braid in the second picture! Nothing says beach wedding as much as a long and loose wavy hairstyle. Parted in the middle, or on the side; half-up or half-down; accentuated with a gorgeous tiara; the choice is up to you – this hairstyle is gorgeous no matter what! Get the look with a curling iron or some beach waves hair spray ! There something gorgeous about a messy bun wedding hairstyle. Simple and sophisticated, a messy bun can really show off a bride’s makeup and jewelry. For the bride who loves the idea of having her hair down, but prefers not to have too much hair in her face on her wedding day: this is the style for you! Romantic and graceful! I love the curls! There are so many creative ways to use flowers in your bridal hairstyles. Whether accenting a simple bun, or using flowers in a loose crown to add a pop of colour, there are no limits to what you can do with simple flowers in your hair! Pin-curled wedding hair is so glamorous, it makes me wish I’d thought of it for my own wedding! A classic wedding hairstyle with a ton of sophistication! The great thing about them: they work with shorter hair, too! More throwback hairstyles that are so enchanting and equally classic! Get inspired by the simply gorgeous wedding hairstyles of the 1950’s! I absolutely love waterfall braids! They never go out of style, and for a good reason! They’re elegant and gorgeous, yet don’t require a ton of upkeep throughout the day to keep the look from falling apart. 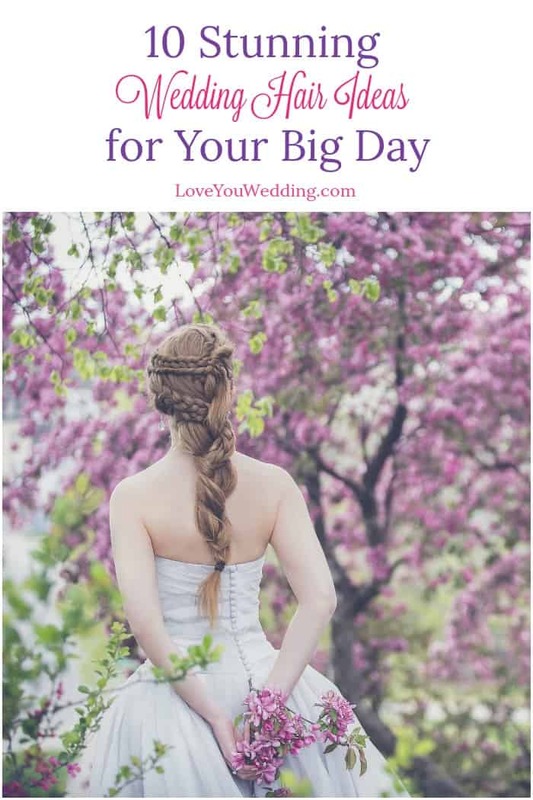 Whether you choose a long and flirty hairstyle for your wedding; or a super short cropped do with a gorgeous birdcage veil, one thing is for certain: your bridal hairstyle should definitely make you the most beautiful woman in the world on your wedding day! What are some of the most beautiful wedding hairstyles you’ve ever seen? Share below!